I've added images from some events under the Media section, and a page dedicated to Summer Camp information. Check it out! 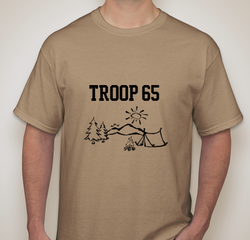 Design the new Troop 65 T-Shirt! - A wicking type shirt would be nicer and more appropriate. - A lighter color would also be cooler in the sunlight. - A design created by our Scouts would be best! - Polyester (Dri-Blend) shirts will be around $7 each. - 100% Polyester Wicking shirts will be about $9 each. So, please encourage your Scout to work on a design for our new Troop 65 T-Shirts! Designs will be due at or before the Monday, May 6 Troop meeting, and they will vote on the entries to decide which design to go with. - The shirt will be a tan color. - The ink will either be black or olive green. - The design must be one color. - The design may be one side or both! Once the design is chosen it will take a couple of weeks to get them done. Contact me with any questions. Looking forward to seeing the designs! LOTS going on, so read carefully to help keep your Scout informed! Meeting held at the cabin, please join us if you can. Please have your Scout working on their requirements to be prepared. This is the required youth training that will follow each Troop election. All Scouts with a Position of Responsibility in the Troop are expected to attend. Swim tests have been scheduled for Saturday, April 27 from 12 - 2pm at New Millennium Fitness in Mebane. Anyone going to summer camp, or participating in any water related activities we may do needs to participate. The test is to evaluate the Scout's level as a swimmer. 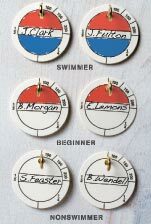 They are classified as a swimmer, beginner, or non-swimmer. We will install our new Patrol Leaders Monday night, and the OA Election Team will come to hold our Troop Order of the Arrow Election. PLEASE be careful when entering the drive to the cabin. There will be some Scouts coming early tomorrow night to work on some physical activities and they will be using the driveway for their walk/run. ALSO, we know the parking is not optimal, but please don't block the driveway. The loop must remain open all the way around so that cars can get through at all times! Thanks for pulling way over and for helping with this. 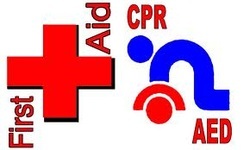 We have a great opportunity for you to learn CPR/First Aid/AED. A trainer from Carrboro Fire/Rescue is planning to hold a class in Saxapahaw on Saturday, March 16th from 8am to noon. Cost is only $1, which covers your certification card. Email me to get on the list, or let us know Monday night. 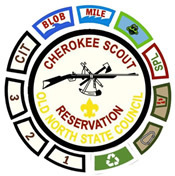 An election team from the Order of the Arrow will visit us Monday night and conduct an OA Election.Scouts meeting the requirements for election will be identified, and the entire troop (youth only) will get to vote. $5 per person for camping due by Monday the 18th. This great new show comes on the National Geographic Channel on Monday nights at 8pm. We watched last week's episode and really enjoyed it. The competitions are based on Scouting skills and they explain them during the show. Check it out! On Friday, March 1st, Troop 65 welcomed ten new Scouts at a bridging ceremony held at our fire ring by the river. Thanks to all of the family members who came to attend this special event and for all the great food they provided for us afterwards! We are happy to have these fine, energetic, and motivated Boy Scouts and a couple of new Assistant Scoutmasters! Please share your photos from the weekend if you would like! After camping at the Scout Cabin Friday night, Troop 65 headed out early for a backpack camping trip in northern Alamance County. We stopped on the way for a delicious pancake breakfast which benefited our friends from Troop 1. The campsites were a little over a mile into the park, over moderate hiking trails. The boys did great as a whole, but we all learned a lot about what to pack and how to possibly pack lighter! It was great to see the young Buffalo Patrol working hard on their early rank requirements, while also having a good time. They worked on fire building, cooking, water filtration, and much more. They are off to a great start. The Wolves and Buck Commanders Patrols also cooked, and did some hiking, geocaching, and fishing. Seeing the excited new Scouts seems to have given these older Scouts a spark of energy as well. Both groups really enjoyed sawing firewood with the folding saw, so be sure to put them to work at home on the firewood pile! Vote for your favorite Troop T-Shirt Design! Only have 8 votes so far! Check them out and vote HERE. 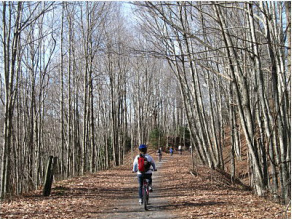 We have reservations to visit the Virginia Creeper Trail for camping and biking April 5 - 7. 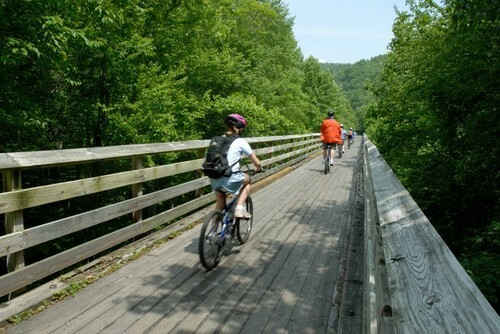 Camping is $5, Bike Rental is $15. We will decide on the food/food costs when we have a better idea of participation numbers, and those riding with others should share the fuel costs. The camping area does have showers! We have to firm up our reservation, so we need a commitment and $5 (non-refundable) deposit for the camping fee by Monday, March 11. If you want to do this, we need to know this Monday night and need the $16 payment (refunded if we aren't able to register). Aside from the other business we discussed at the 2/20 Leaders Meeting, several ideas for trips and merit badges were discussed, as well as a possible fund raiser where all the profit went towards summer camp fees for those who participate. Here's a summary of the options presented so you can educate yourself and your Scout to determine what they would like to take part in. 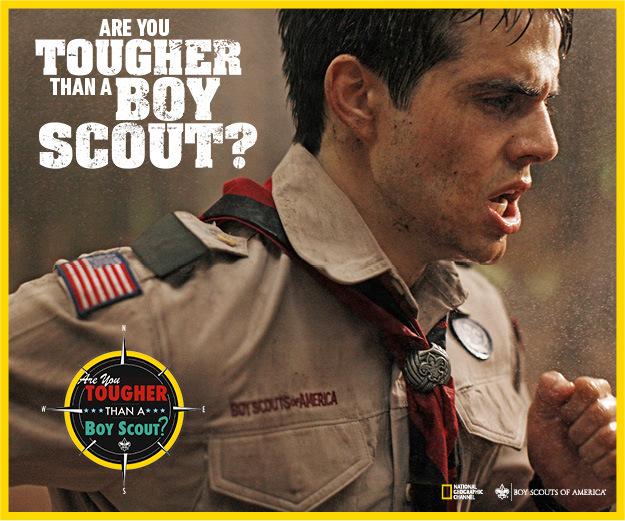 Your Scout is encouraged to discuss outing ideas with his Patrol members, and present them to the Troop. They may need your help in researching their ideas for costs and logistics. Please work with them! Plans for our March outing! All of our outings are important, and we expect every Scout to participate if at all possible. As mentioned in the Guide, attendance is required for rank advancement. This weekend is extra important because we have a new group of Webelos joining our Troop. Let's show them a good welcome! Pot Luck - Finger foods ideal since we don't have enough tables/chairs. Bring enough to feed your crew and a little more. This will be the meal for the boys and leaders that night. We are planning to stop at Applebees in Burlington for a pancake breakfast, in support of a fundraiser that is being held there for Troop 1. Cost is $6 per person. 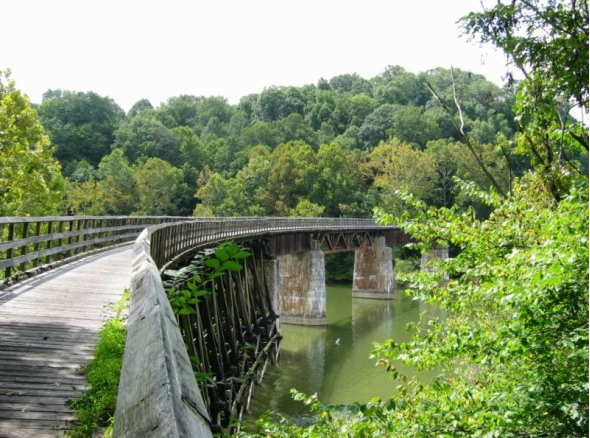 Proceed to Shallow Ford Natural Area, which is on Gerringer Mill Rd near Western Alamance High School. The campsite is PRIMITIVE (only bathroom is a porta-potty at the parking lot), and is about a mile hike so your Scout needs to pack everything needed in a backpack. We will go over what they need at Monday's meeting. IMPORTANT difference here - Each Scout will be responsible for his own meals. They don't have to have their own backpacking stove, as they can share with others, but they will need to bring water and backpacking food such as freeze dried items. The Patrols may talk about this Monday and work together on some items. We will be doing more backpacking so this is a "getting started" trip to see how well they prepare. PLEASE help your Scout by researching Backpacking, Trail foods, and what not to pack. We will inform them, but the more they learn the better. We are shooting for being back at the Cabin for pickup by 11am. Please read over the new Troop Guide book and let me know if you have any questions. There is a lot of important information in here!